If anyone had any doubt that the 26th Marine Expeditionary Unit has been in the thick of it in Afghanistan, let the photo above clarify. That’s Sgt. Paul Boothroyd III, an intelligence operator with 2nd Radio Battalion, out of Camp Lejeune, N.C. 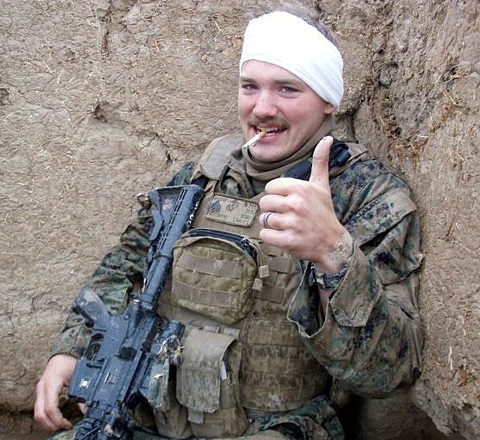 He is shown here on March 4, after sustaining and surviving a sniper round to the head. He was operating at the time south of Sangin, the most volatile district in Helmand province, while attached to the MEU. The bullet — reportedly fired from a 7.62 x 54mm Dragunov sniper rifle — pierced his helmet and came to rest in his neck. Amazingly, it was removed surgically March 16 without any complications. Colleague Brian Shane has the rest of the story here.